In this file photo, orange colored ringed rice coral, or montipora patula, is seen in waters off Waimanalo, Hawaii. The bleaching of colorful coral is spreading into a worldwide, devastating crisis, scientists say, and they predict it will likely get worse. Triggered by global warming and the El Nino, record hot ocean water is causing fragile coral to go white and often die, threatening picturesque reefs that are hotspots of marine life, experts say. The spread of sickly white started more than a year ago in Guam, then devastated Hawaii, infected the rest of the tropical Pacific and the Indian oceans and has now infested Florida and the Caribbean. On Thursday, the National Oceanic and Atmospheric Administration and international reef scientists pronounced it a global coral bleaching event, only the third in recorded history. No place with coral has been spared, though some regions — such as Hawaii — have been hit harder than others, experts said. Excessive heat stresses the living coral, which turns white and then becomes vulnerable to disease. "We may be looking at losing somewhere in the range of 10 to 20 percent of the coral reefs this year," NOAA coral reef watch coordinator Mark Eakin said. "The bad news for the U.S. is we're getting hit disproportionately just because of the pattern of the warming." He called bleaching a crisis, especially with worsening global warming forecast for the rest of the century: "If that's not a crisis, what is?" Eakin said he's especially concerned about Hawaii, which already suffered through bad bleaching in 2014. "Hawaii is getting hit with the worst coral bleaching they have ever seen, right now," Eakin said. "It's severe. It's extensive. And it's on all the islands." In one part of northwestern Hawaii, "the reef just completely bleached and all of the coral is dead and covered with scuzzy algae." Florida started getting hit in August. The middle Florida Keys aren't too bad, but in southeast Florida, bleaching has combined with disease to kill corals, Eakin said. It has also hit Cuba, Haiti and the Dominican Republic and is about to hit Puerto Rico and the Virgin Islands, he said. Warm water causes bleaching and ocean temperatures are at record high levels, partly because of steady manmade global warming and partly because of the El Nino, which is an occasional warming of the central Pacific that changes weather worldwide, Eakin said. Add to that Hawaii's "blob," a pool of warm water that has stagnated in the northeast Pacific. The last super El Nino, in 1997-1998, was the first global bleaching event. A smaller El Nino in 2009-2010 was the second. So far the 1998 bleaching was worse, but that was the second year of an El Nino and we're in the first of two years now, Eakin said. Oceans worldwide are by far the warmest on record — August 2015 was four-tenths of a degree warmer than in August 1998. Next year, he said, may be as bad as this year or even worse. NOAA produced forecasts of bleaching that show it as a giant red blob moving across the globe again. And what worries marine ecologist Gregor Hodgson, who heads the group ReefCheck, is the forecast that the blob will hit the Great Barrier Reef in Australia next spring. The computer model forecasts "this horrendous dramatic" impact on the Great Barrier Reef, Hodgson said. "It's truly terrifying." 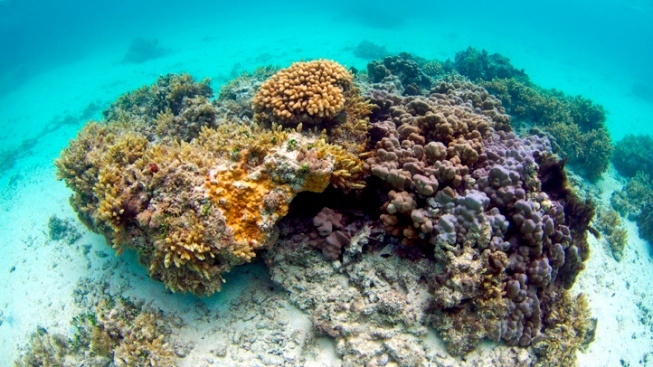 This isn't just a problem for divers and fish; coral reefs are crucial globally, Eakin said. Coral reefs protect shorelines, produce tourism dollars and help provide food for 500 million people around the world, he said. Even though coral reefs are one-tenth of 1 percent of the ocean floor by area, they are home to 25 percent of the world's fish species, Eakin said. "You kill coral, you destroy reefs, you don't have a place for the fish to live," Eakin said.